One good move I did make was on Saturday I decided to order a box of fruits and vegetables from Washington’s Green Grocer. 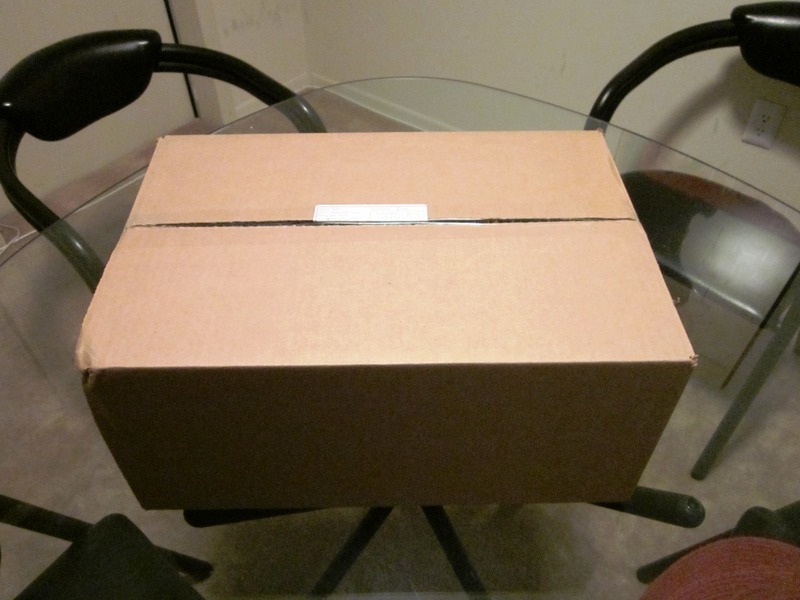 I ordered a box from them one other time which you can read about here, and while I was overall satisfied, I wasn’t impressed enough to order it again since then, which was about a year ago. When I placed the order from my iPhone, I think I misread something because I was under the impression it was coming Monday. My thought was that I wouldn’t have time to grocery shop and when I got home from my trip, I’d have a box of fruits and veggies waiting. After I placed the order though, I totally forgot that I did and there was no box waiting at home on Monday. When I saw the box sitting up against my door like that when I got home, I had NO idea what it was until I took a closer look and realized it was a box full of fresh fruits and veggies! This time, I was REALLY impressed with the value of the box. Everything was in excellent condition, and it cost $31.25 with delivery including all fees. 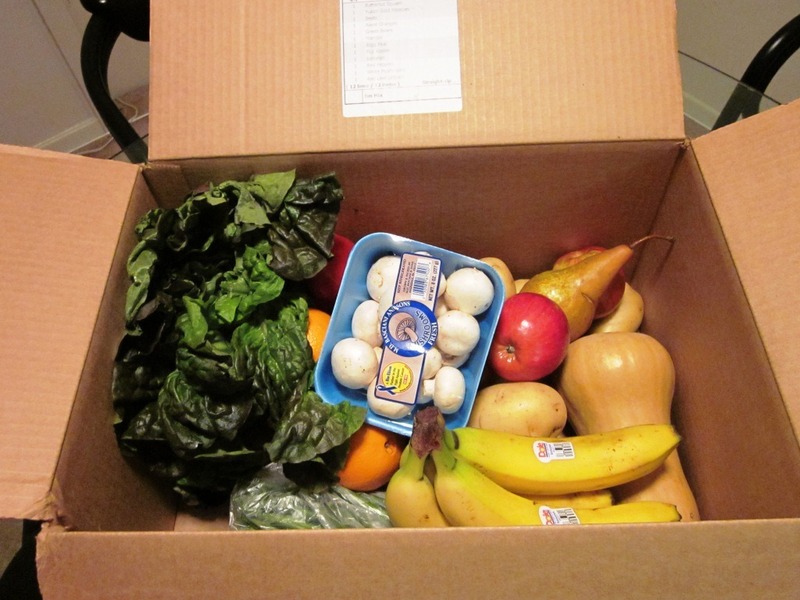 I ordered a small mixed box, which includes some organic, some transitional, and some conventional produce. Check out how much they packed into the box! *Note: This time I requested NO bananas, because last time they were a little bruised up and I am super particular about my bananas for some reason, so I’m not sure what they gave in place, but there was definitely a ton in the box! Quite a lot of produce for just $31.25 including delivery! While I don’t think this will be a weekly thing by any means, I do think I’m going to try to make use of it during particularly busy weeks. I also love the idea of having it delivered when I’m just getting back to a trip and won’t have time to head to the store so that I have no excuses to get back on track immediately. 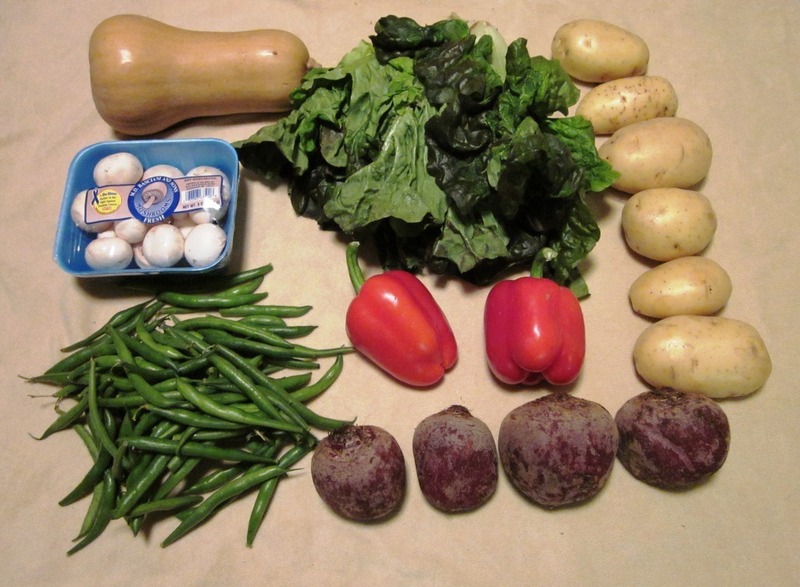 Have you ever used a delivery service for produce and/or groceries? Would you? When I was walking out of work last night, a coworker asked me if I had any plans for the night. I enthusiastically replied, “Well, I am actually pretty excited because I ordered a box of veggies from this company for the first time and its going to be home when I get there!” Then I stopped myself from going any further because of the puzzled slash pitied look I was getting. But you guys can appreciate it, right?? ha. I’ve been toying with the idea of giving it a try for a while now, and this week I finally got around to it. You have to sign up for a box by 8pm on Tuesday, and then Wednesday they deliver the box to your door. They have small or large, and “mixed” or organic boxes. The mixed box has some organic, some transitional (waiting on organic certification) and some regular produce, and the small box is designed for 1-2 people, so I went with the small Mixed and it cost $31.25, including delivery. I was so excited to see how everything looked, and I have to say I was impressed that all the produce was in pretty good condition. The only item I wasn’t super impressed with was the bananas because they were slightly bruised and a little beat up. One great feature of the service is that you can customize your box each week and have them not give you certain things and more of others based on your preferences. So if I do it again, I’ll opt out of the bananas. I’m happy to have all this local and regionally grown produce on hand, though a little overwhelmed with the amount! I can’t imagine how much more stuff is in the large box – I’d hope not double! This is SO much more than my CSA had each week, and this was $31.25 v. the $26 for my CSA over the summer, which I had to do each week. I definitely think this is a better option for me than the CSA so I can just get it when I want to, no strings attached. I wasted no time and broke into the veggies immediately to make a huge salad for dinner. I almost never just have a salad for lunch or for dinner because it’s usually not enough to sustain me, but this one was humongous. Red leaf lettuce for a base, topped with wheat berries, carrots, sauteed mushrooms and onions, red pepper, green beans, and 1/2 a can of tuna packed in water, topped with 2 tsp olive oil and a splash of balsamic. The veggies from the delivery yesterday (red leaf lettuce, green beans, red pepper) were all delicious and tasted very fresh, so I know the quality is there. 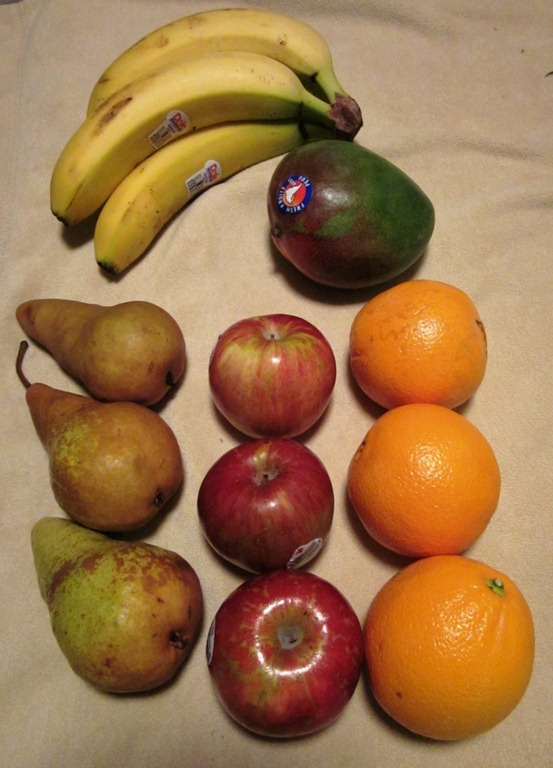 The only thing I can’t figure out is whether that amount of produce is worth $31. I mean when I shop, I always browse the sales and rarely spend $30 on just fruit and veggies. I tried breaking it down based on the cost per item and got a little overwhelmed from trying to add it all up, so hopefully you guys can help me! What do you think? Do those fruits and veggies look like they are worth $31 to you (also considering they are delivered to your apartment)? Do you have anything similar to this where you are from? Would you try it? Sunday night is always kind of depressing, except I did have some great stuff happen with work late last week so tomorrow will be more celebratory than most Monday mornings. That said, I can always use one more day of the weekend… though today has shaped up to be a pretty awesome Sunday. After my bath I made a quick AB&J Sandwich with a sliced up pear. It was exactly what I was craving and really hit the spot. Two slices of whole wheat potato bread, 1 tbsp almond butter, and 1 tbsp Crofter’s Asia. Simple, but delicious. I’ve learned my lesson many times to try to not go to the grocery store hungry because then I buy everything in sight. I already love grocery shopping (too much?) so if I go hungry, its just bad news. This sandwich was the perfect thing to help me from going overboard in the store. I got a bunch of produce (strawberries, bananas, raspberries, spinach, watermelon!) and a few other random things, but only spent about $35. My goal is to try to make it through the week without going shopping again, which should be very doable. Funny that I say that, but then we actually ordered Indian Food for dinner. Neither of us felt like cooking and Indian food is cheap and fast… but no more going out/ordering food after tonight, either. We got three dishes to share, and it came with basamti rice, naan and veggie samosas. The dishes were Alu Chole (chickpeas and potatoes), Mutter Paneer (peas and homemade cheese), and Bengan Bhurta (mashed eggplant and tomato cooked with Indian spices). I had one vegetable samosa (crisp turnover filled with spiced potatoes and peas) and some of each of the three dishes over basamati rice. All the simple pleasures from today… a bubble bath, AB&J, and delivery, added up to an incredible Sunday. Now we’re sitting down watching The Lovely Bones (thank you Netflix!) so I’m going to get back to the movie. Morning! Back to the grind and to work after the holiday. I made a few changes this morning that I think I’m going to try to stick with, but first, last night’s eats. Last night, I had set my alarm for 7 because I was contemplating going out for a run this morning before work. The alarm went off and I got up (for once!) but was not feeling going out for a run. I remembered that I had tried a few of the On Demand workouts from Exercise TV, so I decided to take a look. I found two workouts, the AM Yoga (10 minutes) and the AM Stand-Up Ab workout that I decided to give a try. I made some true overnight oats last night and found another can of organic pumpkin hiding in my pantry! That was an exciting discovery. Really satisfying and I was proud of myself for changing up the toppings. 😛 Sad part is that I had no bananas at home, so couldn’t mash one into it. The banana mashed in there really gives the whole bowl a sweetness you don’t get when its left out and makes the texture a bit creamier, so I need to get on that stat. The good news is I am running really low on Almond Butter so my very first Oats in a Jar is quickly approaching. Stay tuned! Question: Have you added anything to your morning routine that helps you feel more energized throughout the day? I’m not a morning person, so I can’t get up most mornings to do a workout before work (trust me, I’ve tried), but I think doing a quick 10 minute yoga routine is do-able and will help me relax a bit and wake-up in the mornings.